An optional second head is available to run "2-up" numbering jobs. The Count NumberPro Touch is an 18" wide friction feed automatic numbering, perforating, and scoring machine. This machine is perfect for numbering and paginating solution for office applications that need to be numbered after the order has already been set. The NumberPro Touch is a tabletop "Top Feed" Friction feed Number-Perforation-Scoring machine, equipped with deluxe microprocessor, (1) 7- wheel Gothic reverse numbering head and has intuitive touchscreen for easy operation. With the Numberpro paginator, you have the ability to number without the need for collating. Numbering, scoring and perforating sets of forms is achieved quickly and efficiently in one pass by the Count NumberPro Numbering Machine. A frictionless feed system, together with a single forward numbering head, capable of printing nearly anywhere on a sheet makes the Count NumberPro a wise choice for your numbering and form finishing work. Economical, durable and accurate, the Count NumberPro Touch will be a reliable machine for your form numbering needs. Pneumatic Heads for this unit are also available. Includes reliable electric, Gothic wheel reverse numbering heads - with 7 digits, 4 drop zeros and multiple repeats. Optional second head is available to run "2-up" numbering jobs. Perf, Numbering and Feeder Modes. 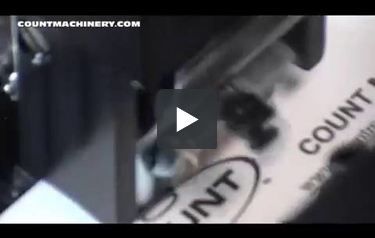 Feeder mode is perfect to use the machine as an automatic feeder for our CountCoat UV coater. Would this machine work on glossy paper? You are able to use a glossy stock with this machine. With a glossy stock it is important to fan the pages when loading the paper into the machine so the pages are separated and the machine is only grabbing one page at a time. With a gloss stock there is just a little more technique involved.